Learn How To Code - AndroGuider | One Stop For The Techy You! Did you guys ever see HTML content or apps made using Java? Of course, you did. But did you ever stop and think about how the programming was done? So many questions arise like: How do they make webpages? How can a webpage take input? How are apps made? Well, it's only natural for you to want to learn programming in order to be able to make what you see on your devices. But the biggest question remains "How do I start programming? Some people would say books. Sure, books is a good medium to learn programming but reading 200 pages of content with absolutely no colour except black and white might seem like a boring idea to some people. Also, some books don't contain creative exercises and you will have to download the compiler (or interpreter) of the language you are learning in order to practically use the knowledge. 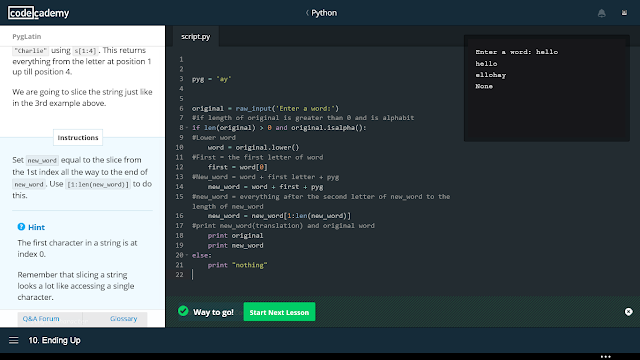 Well, Codecademy is a website which can be a useful substitute to learn coding for free. One would think that it will be really hard to use it in mobiles, considering the structure of the page. But codecademy also has an app in which the content is modified to suit the dimensions of the phone. But it isn't as convenient as the website on a bigger screen. Codecademy also has an "upgrade to pro" option which will prove you access to many projects which are not available to the free users and you can clear your doubts by interacting with professionals. If you don't know which course to start with in Codecademy, I'd suggest to start with the HTML and CSS course. After that, you can do a programming language like Java or Python. You will have a pretty good foundation by then and you can refer to other websites and videos for more information. But in the end, it depends on your conviction and will to learn. However, Codecademy does have some drawbacks. Due its way of teaching, it cannot focus on all the points which come under a specific topic. It gives us a fraction of the features (which is considered most important) coming under a particular topic (or module/package). This puts us under the impression that Codecademy only provides the basics. Like I said earlier, if you want to keep learning about a particular language, you can refer to other websites and videos. For example, Once you do the HTML and CSS course on Codecademy for web developing you can refer to w3schools which gives you a lot more information. Ultimately, Codecadmey is a well built platform for beginners to start programming.